Through a Peerglass: Winnie’s adventures in Wastemonster by Arthur Waghorne. 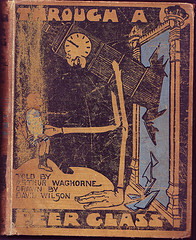 Published by Hodder and Stoughton, 1908. Frontispiece and 44 other illustrations by David Wilson. A political satire based on Alice in Wonderland, including Lloyd George, Asquith, and the House of Lords in concert. Main character is Winnie Churchill. First Edition, First Impression. Large 8vo. Bought on abebooks for £25. Bargain.